Pakistan is led by Sarfraz Ahmed while the Aussies are playing under the captaincy of Tim Paine. At the start of Test cricket, wicketkeepers featured only for their keeping skills and their contribution with the bat was barely considered. As the game started to grow, their importance grew within batting as few of them turned out to be the best batsman of their team. Many keepers lead their country in the limited-overs cricket but only a few of them were graced to lead in the longer format. The ongoing Test match between Pakistan and Australia is one of the rare instances where both the teams’ leaders are wicketkeepers. Pakistan is led by Sarfraz Ahmed while the Aussies are playing under the captaincy of Tim Paine. The Tasmanian keeper-batsman took up the Australian captaincy role post the ball-tampering episode. He leads Australia in Test and ODI formats while Aaron Finch in the T20I format. Thus, the Dubai Test became only the 8th match in the history of the format where wicketkeepers of both the teams are leading their respective sides. The last such instance was in 2014 when Denesh Ramdin of Windies and Mushfiqur Rahim of Bangladesh took on each other in Gros Islet. Interestingly, the previous four instances of two keeper-captains in a Test match were recorded during the matches between Bangladesh and Windies. The first of them was recorded in 1996 where New Zealand were led by Lee Germon in the home Test series against Zimbabwe, under Andy Flower. 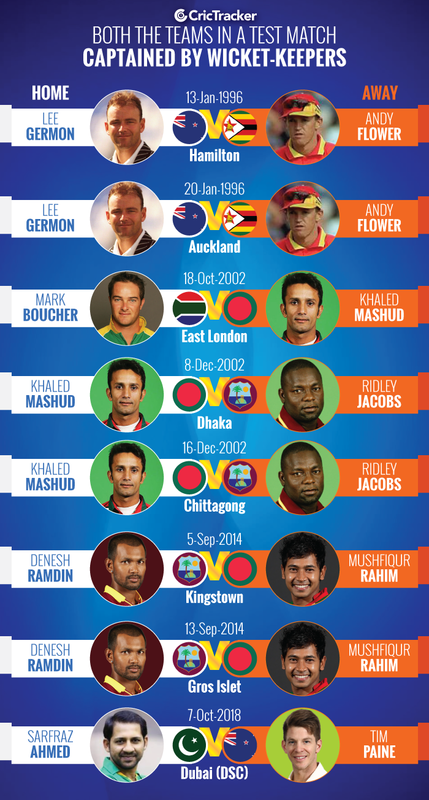 Khaled Mashud is the only one to be involved in three such matches and with two different pairs. He led Bangladesh in a Test match 2002 against Mark Boucher-led South Africa and in the two-match home series against the Windies in the same year who were playing under Ridley Jacobs only for this series. MS Dhoni played 60 Test matches as keeper-captain of India, more than twice of the next best Mushfiqur (28). However, Dhoni doesn’t appear in this list as he never led India against a team with their wicketkeeper as captain. Paine’s captaincy regime also witnessed the first ever International game between Australia and England with keepers as captains that too after 504 matches between the two countries. This occurred during the ODI series in England when Jos Buttler stood as captain in place of injured Eoin Morgan.